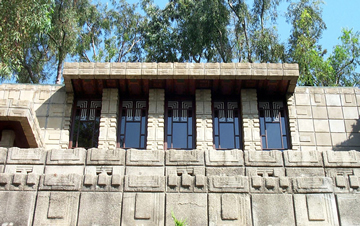 Frank Lloyd Wright's Mayan masterpiece in Babylon, the John Storer House, sold recently after more than a year on the market. The Los Angeles house got a record price for a Wright home, purchased from—who else?—the same star Hollywood producer who resurrected it. 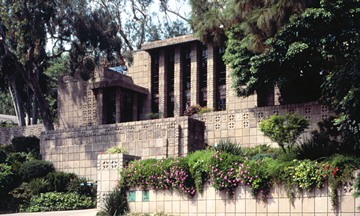 Wright was in a peculiar place in life in the newly roaring '20s when he came to Los Angeles with the idea of bringing organic architecture to the masses through a low-cost material he dubbed "textile blocks." Entering a brief second marriage with a charming but self-destructive woman just as Storer House construction began in '23, he would build four L.A. homes with this Mayan-inspired concrete block concept in the mid-'20s. Wright's organic style truly matured elsewhere during the following decade, but all four still stand and now only one remains on the market. Records show Richard and Jennifer Emerson paid $6.8 million ($6.9M asked) for this Hollywood hillside jewel in an escrow that closed February 18. The Storer House was built in the newly subdivided Cielo Vista tract at 8161 Hollywood Blvd., just west of Laurel Canyon (and three miles down Nichols Canyon from my childhood home). Although blockbuster producer Joel Silver sold the 4-bedroom, 3-bath for $2.9 million in 2003, he is once again listed as the seller. Crosby Doe is the Beverly Hills-based agent who sold the Storer House and is still listing the currently available Wright block house in L.A., the Millard House in Pasadena. "Sometimes it takes a while to sell a piece of architecture," Doe said recently of the sale. The buyers, he said, are "preservation minded." Jennifer Emerson is cited in the couple's 1997 wedding announcement in the New York Times as having a masters in Architecture and Historic Preservation from Columbia. Wright gave up his Prairie School practice in Chicago to design a Japanese hotel before taking work in Los Angeles in the '20s. Pioneering his organic approach with a home for physician John Storer, he hoped to blend the house into the lot's steep, relatively barren hillside environ.